After a one-night love affair with enchanting Vigan, we drove towards Laoag City where we would be meeting Hubby’s college friend. Our Tres Mikaelas, who are such mallrats, got excited to see Robinson’s Laoag (after travelling from Vigan to Laoag, they were dying for cold drinks and a fully airconditioned place); unfortunately, it was closed because of the lenten season. We were toured around the city by the lovely and very kind Tita Gay of Sarrat, the sister of Mike’s college buddy who was sick with the flu. First stop was for lunch at Saramsam, a local resto that serves Ilocano dishes with a delectable twist. We had dinuguan pizza and pakbet pizza, both of which were surprisingly good, and malunggay ice cream that’s to die for. Next was Fort Ilocandia, which brought back memories of a Laoag family vacay more than a decade ago, when I was still young and single, not having so much trouble finding swimsuits that fit. LOL. (Or not.) Despite our original plan to travel to Pagudpud that same day, the time was not enough to explore what Laoag had in store for us. Gay invited us to spend the night in their Sarrat home and despite wanting badly to see Pagudpud shores ASAP we agreed to stay. It was a decision that turned out to be one of the best we had made…ever! Why? 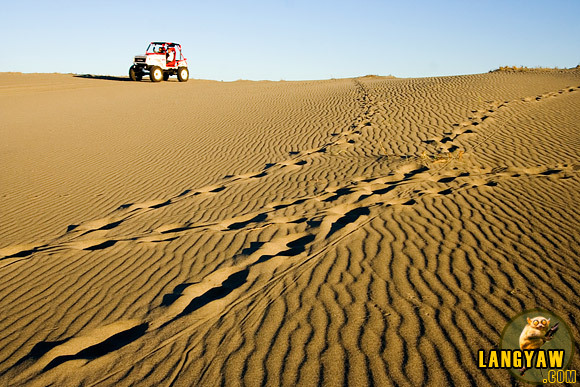 4 words: La Paz Sand Dunes. Let me tell you this, I am an ‘OC’ traveler insofar as destination info is concerned. Prior to the Bolinao trip in 2011, I read tons of resources online, blogs and reviews that would advise travelers where to go, how to go there, and other useful tips to make the most of your trips. I did the same for the Pagudpud trip, but nothing prepared me for the sand dunes experience. It’s probably because I did not read enough about it; suffice it to say it was a shocking and funny experience. Tita Gay introduced us to friends asked us to transfer to a 4×4 rough ride pickup truck (do you even call it that? ), because our car is not suitable for the sand dunes. Since it was a little over 5 o’ clock in the afternoon, they said we were in time for sunset by the dunes. I felt giddy with excitement, anticipating the fab pics we would be taking then. But, as luck would have it, our driver thought we were there for the thrill ride, and so he let the pickup truck ride over the peaks and trails and drop down like crazy roller coaster rides. It was fun, fun, fun and I think I lost my voice shrieking and screaming and laughing out loud like crazy. I actually had blue and pinkish bumps and bruises to prove how rough the ride was, but they were nothing the excitement, the adrenaline rush and the enjoyment we had. What we expected to be sunset photography by the beach turned out to be one helluva ride. Like every blessing in disguise I had so far received in my life, I was thankful we were not aware we were actually going there for the thrill ride, otherwise we would have begged off, apprehensive and scared, not willing to dare. Indeed, life is full of wonderful adventures like these; sometimes, without knowing and with no expectation whatsoever, it is just really nice to take a leap and dive in.